One faithful day in my father's sitting room at Ile-Ife, I thought of involving Government in my Community service project which as at that time already clocked 4years of running Osun State Secondary Schools Music Competition and career show. The following day, I had to set up a committee of friends to work with me on the annual edition of the programme and we went to the then commissioner for Youth and Sports Stephen Kola-Balogun. Barr. Kola-Balogun picked interest in the project and presented the project at Exco level. The project was approved by Mr Governor to make it one of the programmes to mark his first anniversary as GOVERNOR of Osun in 2011. Two Million Naira was approved for the programme. 95% of the then committee of friends that I constituted started misbehaving because of the money and planned to hijack the programme from me. Their ring leader even went ahead in pricing a car he wants to buy from the money. I was attacked and beating on my way from osogbo to Ife by this same committee of friends. Some members of the Exco also did there own to sit on the money which they succeeded in doing. The glorious thing was that we held the programme. Fashola came, Ksticks former music director DayStar Christian center, Aregbesola came although they all came late. BUT many thanks to Hon. STEPHEN KOLA-BALOGUN who stood firmly on my side and later adopted me has his son. He inolved me in some major youth oriented Government projects. He accommodated me in his commissioner's Quarters we lived together throughout his tenure. That opportunity opened me to establish so many relationships. NOTE: Throughout my stay with him, I never requested for a penny from him till date and do you know why? I have a training from Mrs FUNMI AJOSE-ADEOGUN(you need to know her) that "NEVER YOU BEG YOUR MENTOR FOR MONEY). That was my principle and still till date. Subsequently, another annual edition came. I got the Governor's email address from my padi Hon. Mrs Folake Adegboyega she was the then Commissioner for Women Affairs but now currently serving as the Osun outgoing Commissioner for Youths. I WAS SOOOOO CONSISTENT in all State activities and I followed all Government policies to the letter. What later brought me VERY CLOSE to Mr Governor Ogbeni himself was my DARING act to criticise him on policies and then give SOLUTION alongside my criticism. I was very CONSTRUCTIVE in criticising him. Well, maybe many people around him won't say things the true way they appear. It later got to the point that there is no issue I pick up that affects the masses that he won't work on. He listens to me anytime both one on one or in writing and I also never asked him for money for personal gains. I also remember he took time to write a PREFACE in my the book I authored on Leadership and Business Management. 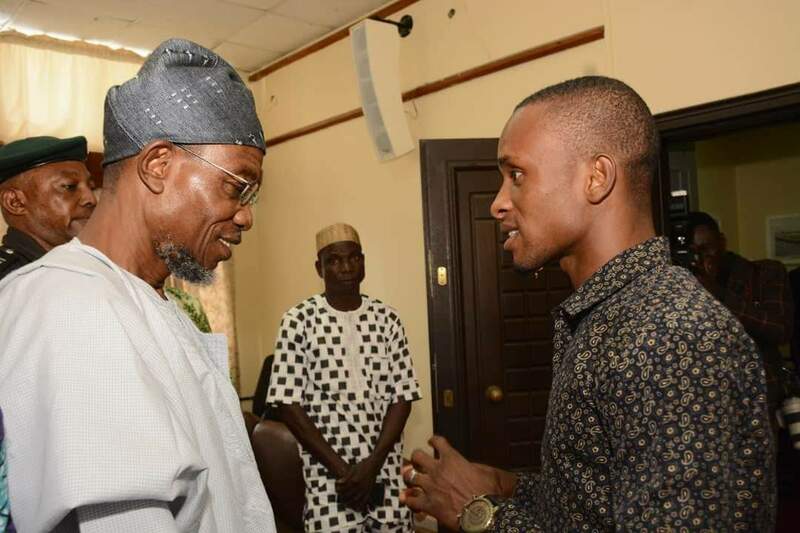 Aregbesola became my father and I became Omo Aregbesola. My hardwork activated the GRACE of God in my life. If he has done something for me, it means he has helped one of the masses. And I give glory to God, through me he has raised directly nothing less than 20,000 students in their various career. I was NO-BODY when he picked interest in me and my activities. No god father and no one to introduce me to him. But I made use of EVERY OPPORTUNITY I had not minding embarrassment from people on my path to success. One more thing he thought me. He said "ELUYEMI, people will criticise you in life at all levels and even claim not to see any good in you, but be focused and know where you are going and what you want to achieve" POWER IS RESPONSIBILITY! RAUF ADESOJI AREGBESOLA ore mekunu, you are indeed the SYMBOL OF NEW DEMOCRACY...Dad, NO DOUBT you have built a whole GENERATION and also laid LEGACIES that coming GENERATIONS will be talking about and also take part of.